Absolver (PC and PlayStation 4) - Supports three player online co-op. Brawl together through the ruins of the Adal Empire in order to learn new combat moves and gain new equipment as you journey to become an Absolver. Our Co-Op Review will go up later this week, and you can check out a recap of our co-op stream here. 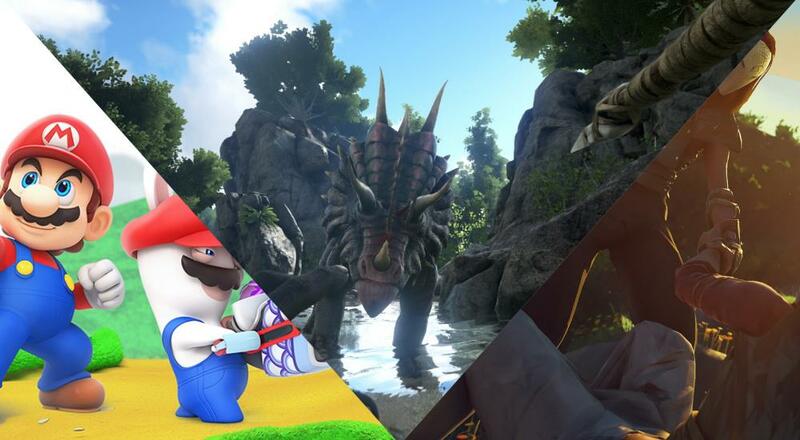 ARK: Survival Evolved (PC, PlayStation 4, and Xbox One) - Four player online co-op for non-dedicated servers (i.e., one player acts as the host and other players join them). On the consoles, two player local co-op is supported on the consoles as well as combo co-op. More players are supported for dedicated servers. Stranded on a mysterious island, you must harvest resources, hunt, research new technologies, and craft items in order to survive and escape. Killing Floor 2 (Xbox One) - Six player online co-op is supported. Tripwire's zombie-killing FPS title is now available on the Xbox One. Mario Rabbids Kingdom Battle (Nintendo Switch) - Two player local co-op in specific co-op challenges. The Mushroom Kingdom has been torn apart by a mysterious vortex, transporting the chaotic Rabbids into this once-peaceful land. To restore order, Mario, Luigi, Princess Peach, and Yoshi must team up with a whole new crew: four Rabbids heroes! Together, they will battle with weapons through four worlds filled with combat, puzzles, and unpredictable enemies. Resident Evil: Revelations (PlayStation 4 and Xbox One) - Two player online co-op in the Raid Mode. In this mode, play as Jill Valentine, Chris Redfield, or Hunk through levels taken from the single-player campaign. The arcade-inspired mode will rank players based on performance and award loot at the end of each level. This is an upgraded/visually enhanced version of those released on the Playstation 3 and Xbox 360 in 2013. More co-op titles are just around the corner, so be sure to check back in with us for all the latest and greatest co-op news and offerings!